Summary: Jane Austen grew up in England at a time when women received little education, and marriage seemed like the only way to get ahead. Her family was poor, and when they did manage to send her to school, she learned only what she would need to know to become a good wife. But Jane was observant and she loved to read. As she grew older, she began to write about the people she saw around her, poking fun at them and the conventions of the day. Her first book, First Impressions, was rejected by a London publisher, but she continued writing, even turning down a marriage proposal to live life on her own terms. Finally, she published Sense and Sensibility, soon followed by First Impressions which was renamed Pride and Prejudice. She died at age 41 in 1817, the same year two more of her books, Persuasion and Northanger Abbey, were published. Includes biographical information, Jane Austen quotes, others’ quotes about her work, and sources of additional information. 48 pages; grades 2-5. Pros: Quite a thorough look at Jane and her times, placing her and her work in the context of her era. The gouache illustrations are charming and bring the time period to life. 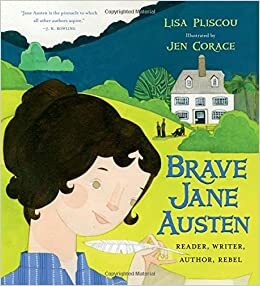 Cons: Most kids won’t have any idea who Jane Austen is or be familiar with her work.